Ebola Virus are generally approximately 80 nm in diameter, 970 nm long. They are cylindrical/tubular, and contain viral envelope, matrix, and nucleocapsid components. The virus generally appears in a long, filamentous form, but it can also be “U-shaped,” in the shape of a “6” (the “shepherd’s crook” appearance), or even circular. They have a virally encoded glycoprotein (GP) projecting as 7-10 nm long spikes from its lipid bilayer surface. Glycoproteins are proteins that contain carbohydrate chains (glycans) covalently attached to their polypeptide side chains, a process known as glycosylation. The glycoprotein GP is the sole resident of the Ebolavirus surface and is responsible for attaching to and entering new host cells. The outer viral envelope of the virion is derived by budding from domains of host cell membrane into which the GP spikes have been inserted during their biosynthesis. 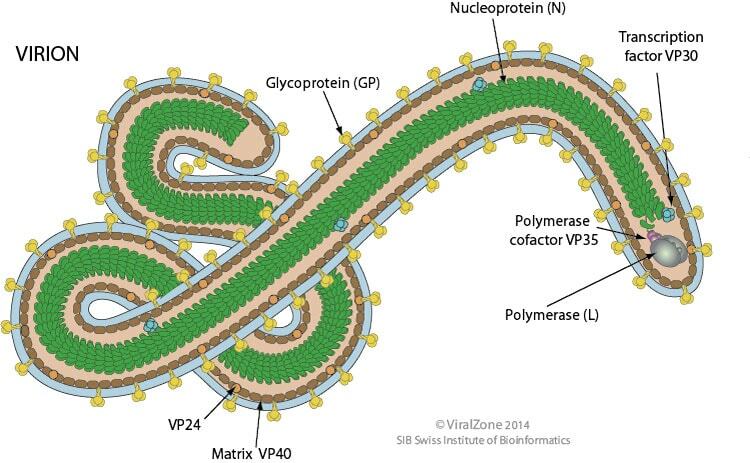 This virus belongs to the Filovirus family, and structurally it resembles a length of thread. 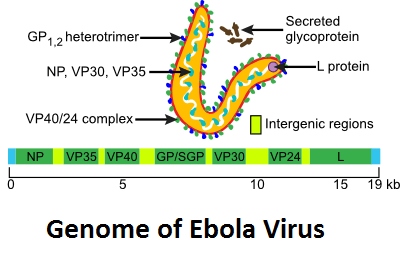 Ebola Virus have a negative-sense, non-segmented single stranded linear RNA genome about 18-19 kb in size. The 3′ terminus is not polyadenylated and the 5′ end is not capped. It contains approximately 19,000 base pairs. It encodes seven structural proteins: nucleoprotein (NP), polymerase cofactor (VP35), (VP40), GP, transcription activator (VP30), VP24, and RNA polymerase (L).